Victoria is the capital of the province of British Columbia, renowned for its beautiful gardens it's been given the nickname the Garden City. 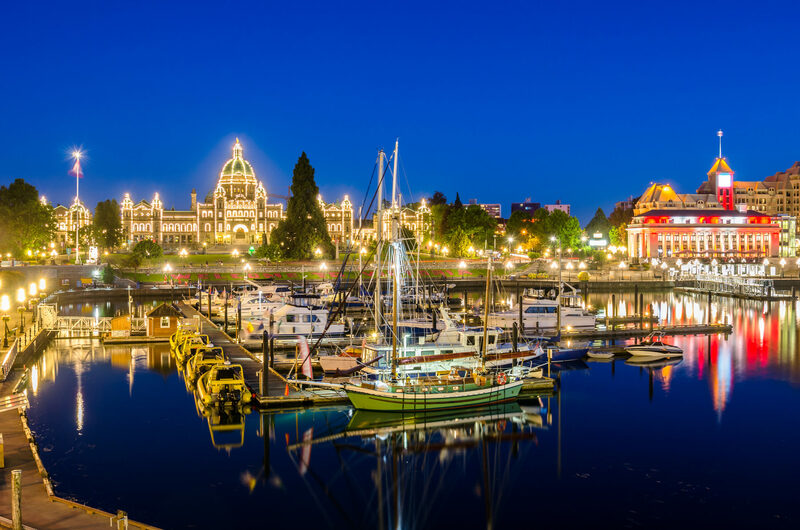 Victoria offers visitors a blend of old world charm and new world experiences. Butchart Gardens is Victoria’s most popular attraction, created in a former limestone quarry over 100 years ago by Jennie Butchart features wonderful themed botanical gardens. Beacon Hill Park is located along the south shore of Victoria, this 62 acre is a haven for wildlife and birds. The Beacon Hill Children's farm features a goat petting area which is the most popular feature on the farm. Take a guided boat trip in Victoria's surrounding waters and keep a look out for killer whales, along with other marine life including seals, sea lions, porpoises. This grand old hotel is situated majestically over Victoria's sparkling Inner Harbour. The Fairmont Empress hotel has become a legendary Canadian landmark. Built between 1887-1890, during the reign of Queen Victoria the Craigdarroch Castle is now a Canadian National Historic Site, explore this restored estate.